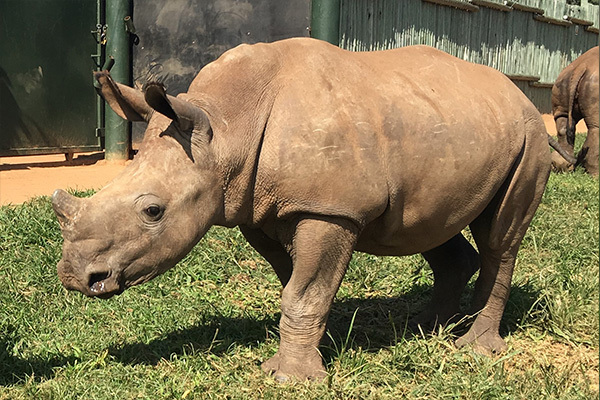 Baby Rhino Rubybelle at Baby Rhino Rescue | Adopt and Donate Now! In August 2017, on full moon, rangers at Sabi Sands heard gunshots. Using the full moon for light, rangers went to investigate in a jet ranger helicopter. They found an adult rhino cow, shot and dehorned. They continued to look for the poachers and using Thermal imaging, the team followed the month old calf to protect her from lions. Rubybelle was darted and retrieved and very quickly the vet and his team were en route to Nelspruit with the sedated calf on the vet, Dr Ferreira’s, lap. Petronel and the team were waiting at the airport. The calf was loaded onto Petronel’s lap and they headed to the CFW Sanctuary. It was a frigid winter night, so the ICU room was preheated for Rubybelle. The team monitored her vitals vigilantly. By 07:00 the same morning, Rubybelle had already drunk 2 liters of milk and electrolytes. Three days later, Rubybelle was let out into the ICU boma for the first time. Hesitant at first, she relaxed and clearly loved it. The next day she had a mud bath! A week later, Rubybelle was introduced to two other young orphans, Khanya and Rose. Despite their size and age differences, Rubybelle integrated with the big girls very well. She has been gaining weight and enjoying a lovely rhino life with the other two orphans in her crash. Luckily, Rubybelle was rescued in record time. Many people were involved in her spectacular rescue. The quick response and loving hearts of all involved helped to save another rhino baby.